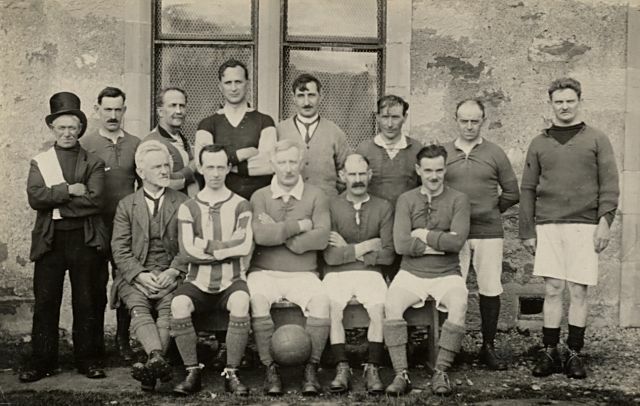 Cromarty Image Library - Cromarty FC - c1920?? Back row: ?, ?,Robert Urquhart, ?, ?, ?, ?, Mr Cox. Front row: ?, ?, Mr Couper, ?, Mr Neill?? Looks like it's outside the Victoria Hall. The picture must be earlier than 1920 because JM Couper, my grandfather, would have been over 50 in 1920. It must be 10 to 15 years earlier. It's a wonderful photograph. I would love to check out the clubs history. My grandfather was a Christopher Francis Urquhart, seemingly came from around the Cromarty area, from the parish of Wester Logie and Urquhart. He played for a club in the area but goodness knows who or where it was. The Worthy on the back row left with the 'Tennent's towel, looks as if he is straight from the 'ARMS'. No Nike & Adidas designer gear in those days !! Not even the same strip, but a fine piece of social history nevertheless. My earlier comment on the date is wrong. Are these older men playing for Cromarty because there were no younger players left after the first war?